The National Commemoration for Yom HaShoah will take place in Hyde Park on Sunday 5th May from 11.30 am – 1.00 pm. 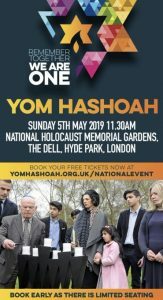 Please follow this link – https://www.yomhashoah.org.uk/nationalevent if you would like to book onto this event. Only limited seating is available so book early!